View cart “Connect 2018 Perth Student Delegate” has been added to your cart. This Non-Member Delegate ticket allows full access to the Connect 2018 conference in Melbourne including all speaker sessions, the trade exhibition and networking drinks at the end of the day. This ticket is available to all members of the public. This Member Delegate ticket allows full access to the Connect 2018 conference in Perth including all speaker sessions, the trade exhibition and networking drinks at the end of the day. This ticket is only available to AUSOUG members and is offered at a discounted rate. If you are an existing member and are unable to buy this ticket please contact our events team on 0411 231 198. This Member Delegate ticket allows full access to the Connect 2018 conference in Melbourne including all speaker sessions, the trade exhibition and networking drinks at the end of the day. 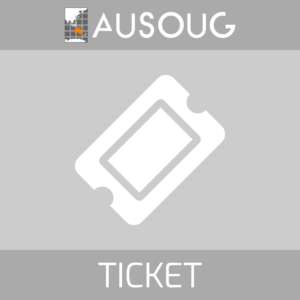 This ticket is only available to AUSOUG members and is offered at a discounted rate. This Non-Member Delegate ticket allows full access to the Connect 2018 conference in Perth including all speaker sessions, the trade exhibition and networking drinks at the end of the day. This ticket is available to all members of the public. This Student Delegate ticket allows full access to the Connect 2018 conference in Melbourne including all speaker sessions, the trade exhibition and networking drinks at the end of the day. It is only available to registered students studying for more that 20 hours per week. This Student Delegate ticket allows full access to the Connect 2018 conference in Perth including all speaker sessions, the trade exhibition and networking drinks at the end of the day. It is only available to registered students studying for more that 20 hours per week.